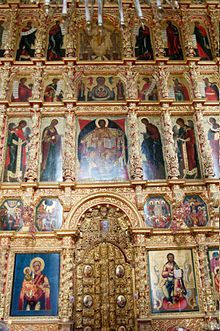 In Eastern Christianity an iconostasis (plural: iconostases) is a wall of icons and religious paintings, separating the nave from the sanctuary in a church. Iconostasis also refers to a portable icon stand that can be placed anywhere within a church. The iconostasis evolved from the Byzantine templon, a process complete by the fifteenth century. A direct comparison for the function of the main iconostasis can be made to the layout of the great Temple in Jerusalem. That Temple was designed with three parts. The holiest and inner-most portion was that where the Ark of the Covenant was kept. This portion, the Holy of Holies, was separated from the second larger part of the building's interior by a curtain, the "veil of the temple". Only the High Priest was allowed to enter the Holy of Holies. The third part was the entrance court. This architectural tradition for the two main parts can be seen carried forward in Christian churches and is still most demonstratively present in Eastern Orthodox churches where the iconostasis divides the altar, the Holy of Holies where the Eucharist is performed – the manifestation of the New Covenant – from the larger portion of the church accessible to the faithful. In the Eastern Orthodox tradition only men can enter the altar portion behind the iconostasis. The word comes from the Greek εἰκονοστάσι(-ον) (eikonostási(-on), still in common use in Greece and Cyprus), which means "icon stand". The nave is the main body of the church where most of the worshippers stand, and the sanctuary is the area around the altar, east of the nave. The sanctuary is usually one to three steps higher than the nave. The Iconostasis does not sit directly on the edge of the sanctuary, but is usually set a few feet back from the edge of the top step. This forms a walkway in front of the iconostasis for the clergy, called a soleas. In the very center of the soleas is an extension (or thrust), often rounded, called the ambon, on which the deacon will stand to give litanies during the services. The iconostasis, though often tall, rarely touches the ceiling. Acoustically, this permits the ekphoneses (liturgical exclamations) of the clergy to be heard clearly by the faithful. In small, modern churches the iconostasis may be completely absent: in such cases it is replaced by a few small icons on analogia (lecterns), forming a virtual divide. The iconostasis typically has three openings or sets of doors: the Beautiful Gates or Holy Doors in the center, and the North and South Doors to either side. The Beautiful Gates are sometimes called the Royal Doors, but that name more properly belongs to the central doors connecting the narthex, or porch, to the nave. They remain shut whenever a service is not being held. Modern custom as to when they should be opened during services varies depending upon jurisdiction and local custom. The North and South Doors are often called Deacons' Doors because the deacons use them frequently. Icons of sainted deacons are often depicted on these doors (particularly St. Stephen the Protomartyr and St. Ephrem the Syrian). Alternatively, they may be called Angels' Doors, and the Archangels Michael and Gabriel are often depicted there. The South Door is typically the "entrance" door, and Michael is depicted there because he is the "Defender"; the North Door is the "exit", and Gabriel is depicted here because he is the "Messenger" of God. These doors may also be casually referred to as the "side doors". There are some exceptions where both the side doors depict Archangel Michael. The most notable exception is of the church of Saint George (Aghios Georgios) inside the Ecumenical Patriarchate of Constantinople (in today's Istanbul). In many monastery churches and chapels (though often not in the Katholikon, the monastery's main church) one may find iconostases with only two doors: the Holy Doors and the North Door. These churches are used for simpler monastic observances when only a hieromonk would be serving alone. Mid-17th-century iconostasis at Ipatiev Monastery. To either side of the Holy Doors are Christ Pantokrator and the Theotokos; above them, the Great Feasts; above them, the Deesis; above that Prophets to either side of Our Lady of the Sign; above them the Apostles to either side of the Holy Trinity. In the center of the Deisis is a large icon of Christ Enthroned. To the left and right are icons of John the Baptist and the Theotokos in attitudes of supplication. They are often flanked by icons of the Archangels Michael and Gabriel, then Sts. Peter and Paul, and then any other important Church Fathers that may be desired for inclusion as space allows. the Twelve Apostles, often to either side of and icon depicting either Christ at the Second Coming or the Holy Trinity. It is also not uncommon to find an icon of the Mystical Supper, which depicts the Last Supper, and by extension the Communion of Saints in the Kingdom of God, somewhere above the Beautiful Gates. The Sovereign tier is always present, but all the others may be omitted. Preference is given to the Deisis or the Feasts tiers if only some of them can be included. Only the largest and most elaborate iconostases include all five. Chapel of the holy icon of Theotokos of Smolensk in the Assumption Cathedral in Smolensk. There are rules regarding who may enter or leave the sanctuary (altar), and by which door. Neither the Beautiful Gates (Holy/Royal Doors – central doors) nor the space between them and the altar table may be used by laity under any circumstances, although infants are either carried into the altar through them in the "churching" rite if they are boys, or if they are girls, the infant is simply presented at the doors. Bishops may enter through the Beautiful Gates at any time; priests and deacons may do so only at specific times during the services when the Gates are open (but during Bright Week they always enter and exit through them). All others enter the sanctuary through the side doors. In a convent only the abbess and elder nuns are permitted to enter the sanctuary (altar), and only by the side doors. The abbess may enter at any time, but the other nuns need a blessing to enter. Male members of the laity who are usually allowed to enter the sanctuary include those involved in the running of the particular church, i.e. cantors and choristers, altar servers/acolytes, church keepers and vestrymen, etc. In the Romanian tradition, on the day of the consecration of the altar in the church, the laity, including women, are permitted to enter and venerate the altar up until the beginning of the Vespers of Consecration. These guidelines were developed over the course of many centuries, with both theologically symbolic and practical reasons for them. The Iconostasis does not really "separate" the nave from the Holy of Holies; rather, it brings them together. The Iconostasis is the link between heaven (the Holy of Holies) and the nave (The Holy Place). Therefore, everything is symbolic upon the Iconostasis. The Icons of Christ, the Theotokos, and various saints and feasts are there because Christ, the Theotokos, the saints etc., lead us and guide us into the Holy of Holies. Therefore, the personages on the Icons upon the Iconostasis guide us into heaven, and therefore the Iconostasis connects not separates. The Icons upon the Iconostasis also are windows and bridges into heaven (although all icons, no matter where, are windows and bridges into heaven). Therefore, in a sense the Iconostasis represents Christ, who is the connection, the door, between both realms. 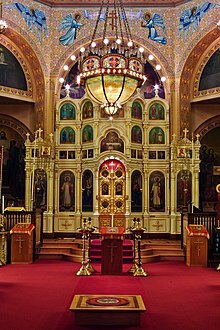 The perfect explanation for the Iconostasis, and its uniting purpose, is seen in Hebrews 10:19-20, "Therefore, brethren, since we have confidence to enter the sanctuary by the blood of Jesus, by the new and living way which he opened for us through the curtain, that is through his flesh." A six-row iconostasis at Uglich Cathedral in Russia. North Deacon's Door (left) and Holy Doors (right). Archaeological evidence from the St. John of Stoudios monastery in Constantinople suggests that the Iconostasis evolved from the early templon. A basilica dedicated to John the Baptist was built in 463 AD. In it the chancel barrier surrounded the altar in a π shape, with one large door facing the nave and two smaller doors on the other sides. Twelve piers held chancel slabs of about 1.6 meters in length. The height of the slabs is not known. The chancel barrier was not merely a low parapet (a short wall); remains of colonnettes have been found, suggesting that the barrier carried an architrave on top of the columns. In early churches, including the "Great Church" Hagia Sophia in Constantinople, the altar, at least in large churches, was under a ciborium ("ciborion": κιβώριον in Greek), usually a structure with four columns and a domed canopy. This had curtains on rods on all four sides, which were closed for sections of the liturgy, as is still performed in the Coptic and Armenian churches. a comparison with the biblical Veil of the Temple was intended. The small domed structures, usually with red curtains, that are often shown near the writing saint in early Evangelist portraits, especially in the East, represent a ciborium, as do the structures surrounding many manuscript portraits of medieval rulers. As the iconostasis grew, the ciborium declined, although some late examples, by now invisible to the congregation, were produced. The templon gradually replaced all other forms of chancel barriers in Byzantine churches in the 6th, 7th, and 8th centuries except in Cappadocia. The invention of the solid icon screen is traditionally ascribed to Saint Basil the Great. As late as the 10th century, a simple wooden chancel barrier separated the apse from the nave in the rock-cut churches in Derinkuyu, though by the late 11th century, the templon had become standard. This may have been because of the veneration and imitation of the Great Church Hagia Sophia in Constantinople, though the columnar form of chancel barrier does predate Hagia Sophia. Fedorov's Deesis, recently added to the retroquire screen at Winchester Cathedral, England. The differently situated rood screens of Western medieval churches often achieved an effect comparable to the iconostasis. The rood screens or pulpita that most Roman Catholic large churches and cathedrals in many parts of Europe had acquired by late medieval times occupied a similar position between chancel and nave but had a different function. The choir was usually east of the screen. Many survive, often most completely in Scandinavia, and more were built in the Gothic Revival, particularly in Anglican churches in England. In examples in wood painted panels typically only went up to about waist height, with a section with wooden tracery above allowing a view through, and then a large carved beam supporting a rood cross crucifix, often life-size, above. Larger churches had stone screens, which might impede virtually all view by the congregation. Iconostasis at the Catholicon, Church of the Holy Sepulchre (tomb of Jesus), Jerusalem. Wikimedia Commons has media related to Iconostasis. ^ So called because the Emperor used to enter by these doors during official ceremonies at Hagia Sophia in Constantinople. ^ Bock covers the use and decline of ciborium curtains in considerable detail, though he is an old source. ^ Kostof, Spiro (1972). Caves of God: The Monastic Environment of Byzantine Cappadocia. Cambridge, Massachusetts: MIT Press. ISBN 0-262-11042-3. "Grove", van Hemeldonck, G., "Ciborium (ii)." In Grove Art Online. Oxford Art Online, subscription required, (accessed April 25, 2011). Wikisource has the text of the 1911 Encyclopædia Britannica article Iconostasis.